“Meet the Makers” is a series of interviews to introduce the filmmakers of the 2016 Willson Oakville Film Festival. Answers are edited for clarity and space. 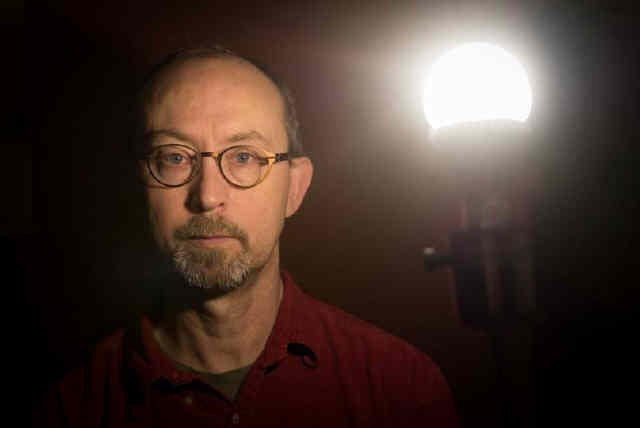 ABOUT THE FILMMAKER: BRIAN STOCKTON is a filmmaker and educator who works across genres, including drama, documentary and animation. He holds an MFA from York University and was a director resident at the Canadian Film Centre. His recent focus has been on humorous films including his acclaimed “Saskatchewan Trilogy” (2002-2006) and “My Dinner with Generation X” (2010). He currently teaches film production at the University of Regina. You can meet Brian at the Willson Oakville Film Festival on Sunday, June 26 following the 6:30PM screening of his film, “The Sabbatical”. ABOUT THE FILM: “The Sabbatical” tells the story of burnt-out professor James Pittman who struggles with a middle-age crisis. Q:Tell us about your approach to the film. How do you approach comedy and how did James Whittingham (who plays the lead, James Pittman) factor into it? Brian: The film was built around James. We’ve known each other for about 30 years. We made a short film together and I felt it was time to do a feature. James’ strength as a comedian is improvisation. We used Improv to try different approaches and tones to find those things that worked best for the film. My goal was to make this movie as funny as possible, so I let James improvise some dialogue and actions within scenes. Once I saw the results, I’d use the shots that worked the best and were the funniest. Q: James and his wife (played by Bernadette Mullen) have an interesting relationship. What’s going on between those two? Brian: When James meets Lucy (the young woman he befriends), the obvious approach would have been to make the wife jealous. So we did the opposite. We made her busy with her own career and life and we made her the type to trust him. We thought it would be funnier this way rather than to make her the stereotypical jealous wife. Q: You put James through a lot. What are you trying to say about men who are experiencing a middle-age crisis? Brian: The perspective comes from experience. I’m a middle-aged man – though I have a great life and I’m happy with what I’m doing – but I’m aware that some people reach a point – life’s half-way point, where they wonder, ‘Did I make the right choices?’ James’ problems are very real and serious to him but they’re first world problems, so it’s funny. The film is saying, ‘Don’t take life too seriously’. Q: Lucy (Laura Abramsen) helps James through some of his issues, though she’s about half his age. Help us understand their friendship. Brian: Lucy is a lot younger but she’s as smart as James and in that way she’s his equal – she’s just not as experienced. Again, instead of the stereotypical older man – younger woman approach, we did the opposite, so the dynamic between them is more interesting. Q: The scenes of James at Lucy’s place when he’s with her young friends show the divide between generations but it says something more. What’s the film telling us? Brian: I think as we get older, at a certain age we become invisible to young people. As a professor I’m around young people a lot and I see this happening as old people complain about the younger generation and younger people ignore or complain about old people. James needs to resolve his issues but first he has to face that he isn’t the same guy anymore. Being in these situations with younger people forces him to do that. Q: What do you want the audience to get from “The Sabbatical”? Brian: I love making people laugh. I want people to leave the theatre with smiles on their faces. Drama is often considered to be the most important film genre but I think comedy is just as important. Q: What else do you want to say about “The Sabbatical”? Brian: It’s a slice of life; not overly structured or contrived. Some people might think it doesn’t follow a conventional approach for movies and some people might think it’s issues aren’t big enough. Some movies are about saving the world but I like movies that are about the little things in life. Those little things are important. Cathleen MacDonald is a writer and filmmaker.